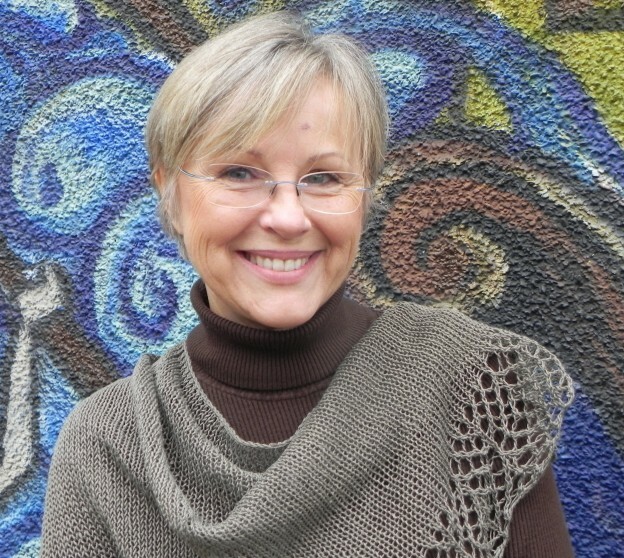 Born and raised in San Paolo, Brazil, Marina came to Vancouver in 1978 to learn English. She also says she “came for love”! She lived with a family that her parents knew, and they had a son, and well, you get the picture. Marina’s Mother actually taught her to cast on, but her Grandmother “infected” her with the knitting bug. She describes her Grandmother as the family’s knitter who just “knit and smoke and drank coffee all day long”. Never using a pattern, Marina remembers her Grandmother putting a large paper bag over her head, drawing out the measurements, then using the cut out as a guideline. After a long career with Air Canada, Marina is now happily retired. She and her hubby have two children and she is a proud Grandmother to two young grandchildren. She loves spending time with her little grandson and granddaughter but also loves to “just sit and knit whenever I want to”. Isn’t that what retirement is for? As the new treasurer of the WCKG, Marina is also busy keeping our books. She just loves Vogue knitting, one among many magazines she browses for ideas and patterns. She’s always got something portable with her (usually socks) and on the needles now is a pattern from WCKG’s own, designer Holli Yeoh. The sweater is “Storm Watch” and the yarn is from Sweet Georgia. Can’t wait to see it at Show & Share! You might find it on Ravelry…Marina is Zoolander. When put on the spot to identify her most rewarding project she quickly replied, “they’re all rewarding”. When pressed, she said that the sweater she designed during a class with Jean Wong was a truly rewarding knit. Made for her husband out of royal blue ultra alpaca, it is a garment he wears often. She admits to having a three quarter length fuzzy mohair coat, with an entralac pattern, awaiting completion for 32 years! Marina especially loves to knit with blues and natural shades (isn’t the caplet she’s wearing in the photo lovely?) Alpaca is a favourite, but she’ll knit with anything that is “soft and fuzzy”. “I’d love to knit an intricately patterned dress out of a cashmere/silk blend. It would be lacey, and would have lots of drape”. Sounds stunning Marina…get knitting! A member since 2011, Marina joined at the encouragement of our president, Edita, who was teaching a class at Wool and Wicker. She says she feels right at home with all the other “infected” knitters and she loves Show & Share. Marina is also WCKG’s treasurer. This entry was posted in member profile on November 27, 2014 by Marlene P..